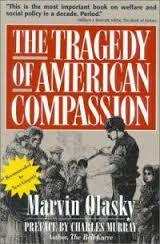 I just finished reading The Tragedy of American Compassion by Marvin Olasky. The book traces the history of compassionate giving and welfare in the United States through history. Beginning after the civil war with religious institutions dominating the charitable giving realm pushing back against the ideas of Social Darwinism and the ethos of survival of the fittest. It then navigates through the turn of the 20th century and the gilded age, the hard times of the Depression and the emergence of the New Deal under the guise of temporary assistance, through the Second World War to LBJs Great Society up to the modern welfare state. Olasky’s evaluation culminates by stating that the most successful welfare programs are those programs that not only distribute money to those in need in a responsible manner but are also successful in restoring the dignity back to those who have lost it, enabling them to eventually recover from the unfortunately events that resulted them being in need. I would say that if you have an interest in American History then this book certainly could be for you but if you are looking for a casual read I doubt that you find it that interesting and for that reason this wasn’t my favourite book. Although certainly interesting from a content standpoint, the book is so laden with historical examples and quotations that it drags down the narrative. This information does an excellent job of illustrating the distortive impacts of charity and welfare on society by repeatedly focusing on the incentive to not work, the narrative is bogged down in extensive detail that for me made the book heavy to read and tough to make progress through. For researchers this detail could be advantageous but for a casual reader the book becomes tough to read. The large number of organizational names, charitable leaders and long quotes taken through history help build Olasky’s narrative at the price of readability in my opinion. Overall The Tragedy of American Compassion is an excellent historical overview of welfare and charitable giving in the United States, that provides important lessons about the failings of current welfare system by examining the past unfortunately the book isn’t the easiest too read.